Posted by Farzana Naina in Graveyard. Posted by Farzana Naina in Pakistan. Ustad Inam pours his soul into his work, only to sell it for next to nothing. His art is resold at prices many times over what he earns in upscale galleries and shops, but he works hard regardless, just to keep his craft alive. He sits on the dusty floor by the cemented walls of his small studio in Landhi, his rough fingers skillfully engraving a dancing Anarkali on a brass vase, unaware of the fact that he is the only karigar in Karachi who specializes in engraving scenes from the Mughal era on brassware. Because he is not aware of his own value, Ustad Inam sells his art for much less than it is worth, just to ensure he can feed his family of eight. Ustad Inam, 37, deftly engraves cultural and historical scenes on brass vases, employing the Muradabadi craft of his forefathers, generally known as khudai ka kaam. His work distinguishes itself from the regular phool patties that decorate brassware found in abundance in Peetal Gali at Golimar. Ustad Ikram learnt this art in Muradabad, the hub of engraved art in India for centuries, and practiced it innovatively after he migrated to Karachi. Inam himself does not know how to engrave all of the hundred figures though. “I worked with my father for 20 years, but he died before he could impart all his knowledge to me.” Inam is saddened by the fact that his father’s specialised art lays buried beneath layers of earth instead of having been passed from one generation to the next. Attempting to preserve the centuries old art, Ustad Inam now along with his two brothers practices whatever little he had been able to learn from his father by labouring for a wholesaler in Golimar. The Mughal era comes to life the moment Inam works the last stroke on the brass surface. Mughal courts come alive as a young prince sips his wine and enjoys the dance of a seductive courtesan. A doe-eyed princess lays her head on her beloved’s shoulder and watches a lion chase deer in the woods. The haunting melody played on the rabab of the woman sitting by a snake charmer seems to mesmerize not only the young girls in the scene but the person holding the vase too. One’s heart misses a beat just viewing the etched woman playing with deer by houses emitting smoke from their chimneys. So intricate and captivating are the scenes etched onto the surfaces of Ustad Inam’s vases, that they transport the viewer into another realm. “Detailing these figures requires a lot of hard work and is very time-consuming too,” Inam tells Kolachi while engraving the tiniest flowers on a dupatta adorning a beautiful princess. “All etching on the vases is done by hand and even the smallest jerk can ruin a day’s worth of effort,” Inam adds as he painstakingly colours the tips of leaves on the dupatta. Ustad Inam usually makes up to fifty vases in a month. As he is very thorough about the detailing, fully decorating even a six inch vase takes him around three to four days to complete. “Vases are washed in acid before anything else. Then they are sprayed with deco paint, sketched on and the background of figures is painted in different colours. Once this is done, the composition is engraved and colour is stippled in using a straw. The final piece is dried in a furnace and polished before being plastic-coated,” he tells Kolachi. Despite all his painstaking efforts, Inam only manages to make a paltry 10000 rupees each month, and sometimes not even that. A pair of 40 inch vases made after a week’s labour sell for 6000 rupees at his seth’s shop in Golimar, yet earns him no more than 200 rupees. Brassware handicrafts don’t have a huge market in Karachi. According to a rough estimate, the city holds only five per cent of brass made handicrafts, which can be found in Golimar, Cooperative Market, Zainab Market and a few shops in Clifton and Zamzama. The rest are sold to markets in Islamabad and Rawalpindi. A major chunk of profit is earned through exporting brassware to China, Saudi Arabia and Canada with the pieces depicting Mughal culture sold at prices approximately 25 per cent higher than the regular, uncoloured pieces worked with phool patti. However, he complains that despite all his effort and hard work, the business-savvy people he deals with stand in his way forward. Inam tells Kolachi that when he tried selling his vases to wholesalers, they would often reject pieces even for the smallest defect, and pay him in installments instead of paying the full amount. Ustad Inam realizes that his present wholesaler exploits him by not paying him enough and never giving him a raise, but he has not considered switching jobs. As a result of the the tiny amount he earns every month, yet still being bound to the job because of his debt, almost serving as a bonded labourer, Inam has stopped picturing any kind of change, nor does he work towards it. Ustad Inam’s years of practice, and his chosen profession being one he is quite devoted to have ensured that his work is always finished to perfection. Though his work demands to be appreciated for its precision and aesthetic value, Inam dreams simple dreams for himself. Posted by Farzana Naina in Pakistan, Politics, Urdu. Posted by Farzana Naina in Karachi, Pakistan. Inaugurated as Sind Arts College by Lord Reay, Governor of Bombay on 17th January, 1887 and renamed D.J. Science College (upon completion of the present structure), on 15th October, 1882. 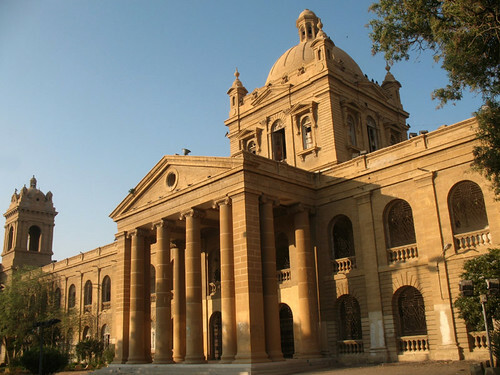 Located in the heart of old Karachi, the foundation stone for this college was laid on 19th November, 1887 by Lord Dufferin, Viceroy of India. The college is named after Diwan Dayaram Jethmal its main benefactor. The cost of construction is reported to have been Rs.186,514 out of which the Government contributed Rs. 97,193, the balance being raised through public donations. 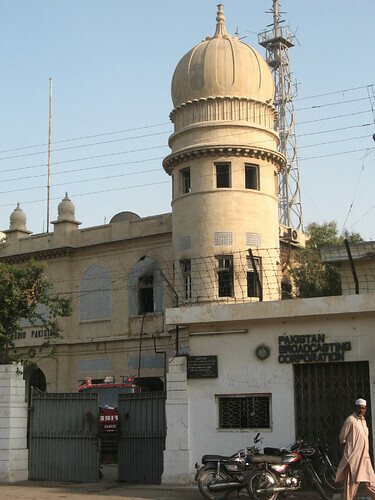 The century old heritage building of Radio Pakistan located on the main artery of the mega-metropolis, M. A. Jinnah Road went on blazing, as the studio over there had suddenly caught fire on Sunday morning “October 28th 2007”.